REDDING, Calif. – Simpson University head men's basketball coach Matt Thacker will be getting a new addition to his Red Hawk family from a family member at home. Coach Thacker's youngest son, Dalton, signed a letter of intent to join the Simpson University basketball team this fall. "I'm really excited to have Dalton play for me," said Coach Thacker. "He is a tough-nosed player who never gets outworked. He is the most tenacious player I have ever watched, and it will be a real treat to see him play over the next four seasons." The 6-foot-2 point guard from Mark Morris High School in Longview, Wash., was a four-year starter at the high-school level and brings several athletic honors to the Red Hawks. Thacker previously led his school team in scoring, rebounds, assists, and steals and earned 1st Team All-Conference honors his junior and senior year, 1st Team All-Area, and All-Star MVP. He was ranked 4th All-Time in assists at Mark Morris High School. Thacker's decision to join the Red Hawks came after careful consideration. "Dalton had several opportunities to play both football and basketball at the college level," said Coach Thacker. "I think finally, even though he could have had a lot of success elsewhere, we are a close family and wanted to stay together. Simpson also has a lot to offer him." 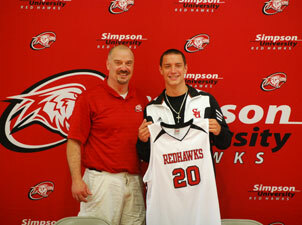 Coach Thacker said Dalton's size and athleticism will make him a strong addition to the Red Hawks team. "Dalton brings the ability to score, pass, rebound and handle the ball under pressure. He can guard three positions and at 6-foot-two he can post smaller point guards up on the low block. I expect Dalton to have a strong assist-to-turnover ratio and get his teammates the ball in good positions to score. I have no doubt that he has the skills to be an impact player in our conference." Coach Thacker was hired at Simpson University earlier this year and brings over 30 years of coaching experience.